Jump Start Sports provides well-organized recreational sports programs in an environment that is more focused on fun and learning than on competition. We offer summer camps, preschool sports programs, recreational sports leagues, and after-school programs that teach fundamentals, sportsmanship, and teamwork. Our programs are creative, age appropriate and considerate of the needs and time constraints of the whole family. Jump Start Sports, LLC was founded by Rick Hart of Hudson, Ohio in 2002. After battling a life threatening illness, Hart left his role as a management executive for a successful advertising business to dedicate his life to his greatest passion, impacting the lives of children through sports. Our Philosophy: We believe that participation in sports enhances the physical, emotional, psychological, and social development of children. Through this participation, children learn how to grow from failure and achieve success with grace and humility. They learn the value of hard work and effort as it pertains to individual goals while also understanding the importance of teamwork and sportsmanship. Our programs are designed to help children develop an appreciation for how regular exercise contributes to a healthy lifestyle. Opportunities for All: Jump Start Sports programs are fun oriented, non-competitive, and designed for athletes of all skill levels. Although our programs are not specifically designed for children with special needs, all of our programs are inclusive. Diversity in Programming: Contrary to the trend in youth sports to encourage specialization, research shows that children attain a higher level of long-term athletic success if they are exposed to a wide variety of sports in their developmental years. 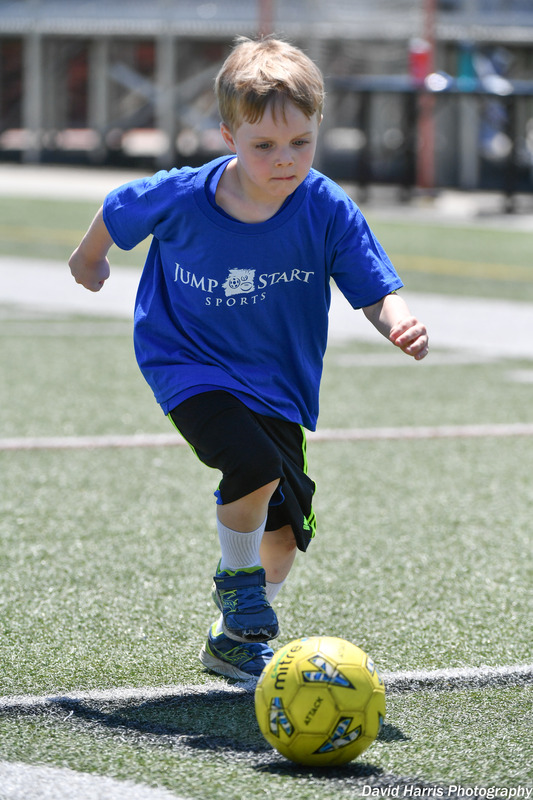 Jump Starts Sports provides children with an opportunity to explore in a safe, well-organized, age-appropriate setting. Positive Coaching: We believe that all people respond better to positive reinforcement than to negative criticism. All Jump Start Sports programs are designed to foster learning and the development of lasting relationships in a positive and encouraging environment. By introducing children to sports in this way in their early years, we have been able to inspire thousands of children of all skill levels to further their love for sports and to benefit from their participation. For a feel for how our camps and programs run, please watch this short video.